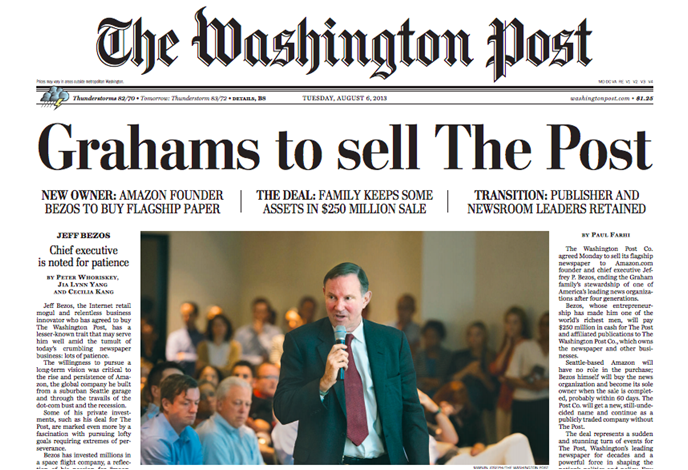 Yesterday Jeff Bezos bought The Washington Post, paying $250m for the newspaper (but not the building its in, or related companies like Slate). "Honestly, I think newspapers have traditionally been vanity projects for wealthy families. It's just new wealthy people owning them, now." & also to make jokes about 5 star reviews, 'You might also like The Anchorage Daily News' etc. Without going into my rant about newspapers (short version - they are very good at defining their audiences, and clustering people of similar interests), from the largely positive coverage I think a number of things are interesting. "There will, of course, be change at The Post over the coming years. That’s essential and would have happened with or without new ownership. The Internet is transforming almost every element of the news business: shortening news cycles, eroding long-reliable revenue sources, and enabling new kinds of competition, some of which bear little or no news-gathering costs. There is no map, and charting a path ahead will not be easy. We will need to invent, which means we will need to experiment. Our touchstone will be readers, understanding what they care about – government, local leaders, restaurant openings, scout troops, businesses, charities, governors, sports – and working backwards from there. I’m excited and optimistic about the opportunity for invention." What sort of ways could he bring his expertise to newspapers? I've always thought that there was huge potential to do something radical to create a new model for newspapers, or do something to save them as organisations. Now maybe we have someone with the right skills and ways of thinking to do both. "I'm 13 and none of my friends use Facebook"